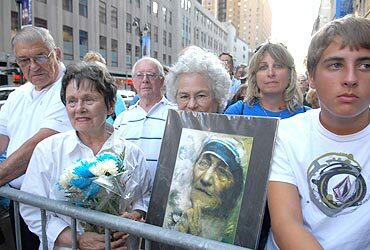 While the world celebrated the 100th birthday of Mother Teresa on August 26, hundreds of people participated in a protest rally in front of the Empire State Building in New York City. The authorities of the iconic building had refused to illuminate it in honour of her. Lighting the 102-story high-rise on Fifth Avenue in Manhattan in different colours to mark an important date, cause or personality is a New York tradition. The Catholic League had requested that the building be illuminated in blue and white, the colours of the Missionaries of Charity, which was denied by Anthony Malkin of the Malkin Holdings, the owner of the building. At the protest, the loudest cheers were reserved for Dr Uma Mysorekar, president of the Hindu Temple Society of North America, who manages the Flushing Ganesha Temple, the biggest temple in the United States. In a spirited speech, she termed Mother Teresa as a great, glorious woman, who represented the goodness in humanity. "It is inconceivable that somebody in the right sense would refuse to honour her. She is more than a religious figure. Though she was a Catholic, she went beyond that and served all humanity. I humbly appeal to the authorities to reconsider their decision and pray to God, whoever is the God, to give them the wisdom to take a decision to honour a person like her," she said. She earlier told Rediff-India Abroad that there was nothing improper in holding a rally against the decision of the building owners. There would be no shouting or emotional display, she said, adding that it was just a peaceful expression of dissent. Though the building is privately owned, it has a special place in the civic life and should not have ignored the wishes of so many people, she noted. Dressed in a sari, she came with Jaya Sivamoorthy, who is also associated with the temple. Among the participants in the rally were a number of people from the Bangladesh Christian Alliance. Dennis Rozario from Mausaid village near Dhaka said that Mother Teresa had established a centre there to help the locals. 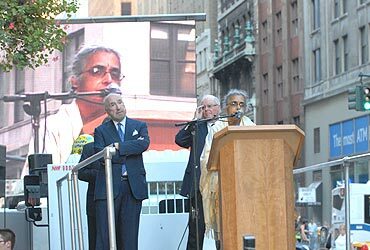 Lawrence D'Costa, whose two sisters are nuns in Bangladesh, felt that it was his duty to come forward to honour the most well known nun in recent times. "She does not need such an honour. But lighting for her recognises her work and honours her memories. After all, she worked for all people," he noted. Dr Venny D'Silva from Goa noted that the Empire State Building was iconic and had gained more importance after the destruction of the World trade Centre. 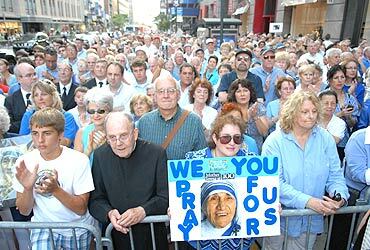 New York City Council Speaker Christine C Quinn, who strongly criticised the refusal, had declared the day as 'A Day of Service for Mother Teresa' and had asked New Yorkers to light up their homes and businesses in honour of Mother Teresa. 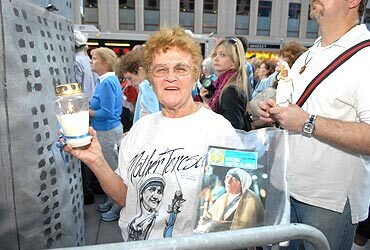 "The Empire State Building can go ahead and light their building however they want, I'm putting a light in my window for Mother Teresa," Quinn had said earlier. Other speakers included Bill Donohue, president, Catholic League, New York State Senators Ruben Diaz and George Maziarz, Council Members Vincent Gentile, Peter Vallone Jr and Danis Rodriguez. In a statement, the management of the building said they do not light up the building for 'religious figures or on requests by religions and religious organisations,' though they light up for the religious holidays of Easter, Eid al Fitr, Hanukah, and Christmas. "We are saddened by the hateful words and messages being generated both for and against lighting for Mother Teresa's 100th birthday. We surely wish that the emotions of those in favour be directed towards good actions of community service in the spirit of their views, and that those who are against be dignified and respectful in their dialogue," the statement said. "The Empire State Building's tower lights recognise key milestones, events, charitable organisations, countries, and holidays throughout the world, not political or religion related events. We are privately owned, and our policies and practices are subject to change in accord with ownership's preferences," it said. Critics noted that the building had been lighted for singer Mariah Carey, dog shows, cancer charities -- and even the 60th anniversary of communist China. "There's a bias, an anti-Catholic bias," Donohue said. "They don't come right out and say it. They don't want to admit it because in society you pay a price for bigotry." 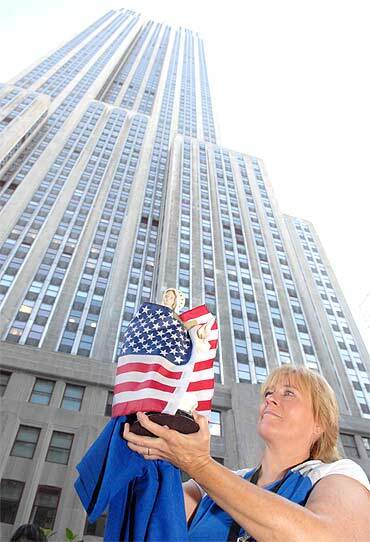 On the eve of the rally, the New York City Council decided to allow another skyscraper two blocks away at 15 Penn Plaza, which would overshadow the ESB in stature. The owners of the Empire State Building asked the City Council to block the 1,216-foot-tall tower, but their plea was denied. "Some councilors called it karma, since the Empire State Building refused repeated requests from legislators to light blue and white bulbs in honour of what would have been Mother Teresa's 100th birthday. Maybe, in the future, the Penn Plaza owners will listen to the voice of decency and light their building in honour of Mother Teresa," it said. Mother Teresa died in 1997, at 87, and was beatified, the last step before sainthood. 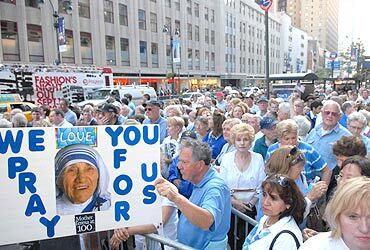 New York Archbishop Timothy Dolan said that Mother Teresa might be overwhelmed and unhappy with some of the attention surround the lighting controversy. "She was humility personified. She didn't like a lot of attention. She ran from it. She shied away from it," he said. Dinesh D'Souza, who took charge as the president of the King's College, an evangelical institution in New York, compared the controversy to the Ground Zero Mosque issue. "You must distinguish between a 'right,' and how that right is exercised. Do you have the right? Yes. Should you? That's a different question," he told the media. Was Mother Teresa's Nobel Peace Prize illegal?